It has been eight years since my last trip to Asia but as soon as I stepped into the humid air outside Yangon airport the distinctly "Asia" smell was unmistakable and brought me right back, instantly reminding me of the good times I’ve had on this colourful continent. We pushed our trolley through the crowd of waiting men and women. Most of the men were in business shirts, long traditional skirts and sandals and some of the women wore the mud on their faces I had read about - already a different scene from anywhere else. Driving out into the busy traffic of Yangon the first thing we noticed was the car was on the right hand side of the road and so was the steering wheel, which was mildly disconcerting! This was the case in most of the cars around us but not all. The taxi driver said they changed the driving direction when the British rule ended but it’s cheaper to import right hand drive cars from Japan and Thailand so people just get used to driving that way. The drive from the airport in a new country is always my favourite. First impressions of Yangon include ancient buses filled to bursting with people, hawker stalls on the side of road, people swatting down eating bowls of dinner, stunning pagodas and falling down buildings. I love Asian breakfast; fried rice topped with a fried egg is a great way to start any day. We headed out for a wander around the somewhat chaotic streets of Yangon. It was refreshing to wander so freely in a city without hassle. There were a few very polite kids selling postcards but a simple "no thank you" was sufficient to send them on their way. Everything happens on the streets. All the shops behind the sidewalk are dark. Even the ones with generators have the lights off. On the sidewalks people are selling betel nut packages, cigarettes, corn on the cob, fried prawn patties, offal steamboat, mandarins, bananas, pomelo and several types of fruit we don’t recognise. Then there are streets with book vendors, others for all things electrical. We walked down one street where everyone was jig sawing shopfront signs on the footpath. A midmorning tea break at a typical Myanmar teahouse was a nice local experience. Locals drink black tea with condensed milk. The waiter brought out a delicious fried prawn snack with chilli sauce that appealed far more than the suggested cream puff topped with melted cheese! More walking earned us an appetite for noodles. My plate of Shan style noodles seemed Chinese influenced but Aaron's flat rice noodles tasted quite Thai. We are noticing Malay flavours as well but everything is at least slightly different too, making it distinctly Burmese. We visited the massive 70meter long reclining Buddha - definitely the most amazing Buddha I have ever seen. Grand plans to head to Shwedagon Pagoda were shot when we found a bar. Beers watching the sun go down over the pagoda was a fitting end to a long day in Yangon. To say the Shwedagon Pagoda is an impressive structure is an understatement. The 325ft stupa covered with 25tons of gold was largely covered up by hessian sacks and bamboo scaffolding for restoration work but the enormity and beauty of it was still clear. The top is crowned with a 76-carat diamond and over 75000 smaller diamonds and other precious jewels. None of these can be seen from the ground, as they are right at the very top. It makes me think "what a waste" but I guess the Buddhists don’t feel that way. Its free entry for locals and there were quite a lot looking around and praying. I remember the monks in other countries being quite aloof but the ones here are always smiling at me and occasionally they will snap a photo of us and look shy when they get caught out. We drove for over an hour in Friday night traffic out of the city into the suburbs to the bus station. There are no motorbikes allowed in the centre of town, this makes it quite different from all other Asian cities we've visited with their bikes and scooters zooming in and out of traffic. Sure enough as soon as we were outside the "no bike" zone there were families all crammed on to one bike sans helmets as usual. The overnight bus station was chaotic. Our seats were double booked so we had about five employees clucking around trying to sort it out. There was so many staff members everywhere but the efficiency was pretty low. After moving seats eventually buses we were off. The seats reclined to a decent comfort level and there were even on demand TV screens. We were in the very front seats so before passing out we just looked out the front. Unsurprisingly the roadside services were pretty shabby. After two service stops and a pretty painless bus ride we arrived into Bagan in the early morning. We arrived just in time to see some hot air balloons on the rise over the temples. Most of the temple goers were foreigners but every now and then there was a local praying or sitting on top. One local woman sitting on a terrace peaked my interest as she was looking around appreciating the sights with a very proud look on her face. The local people seem very proud of their heritage and welcome tourists and genuinely hope we enjoy the sights of their country. They dress well and look after their homes and belongings. The taxis are spotless and the drivers seem to dust down the engines several times a day so they are even sparkling on the inside! New Bagan has a few hotels and restaurants around but there is no vibe to the place perhaps a sign of how new tourism is to Myanmar. The restaurants are spread out and difficult to find and most of the place is dark and quiet after dark. Certainly not the same as other South East Asian places we have been where there are places for tourists to eat and drink and spend their money well into the night. For our second day in Bagan we followed the lead of the vast majority and hired E-bikes. They made quick work of the distances between temples and being electric meant they were quiet and didn't distract too much from the peacefulness of the place. It was a joy to get away from everyone and be privileged enough to discover the lesser visited temples completely on our own. We clambered up huge steps, through tiny internal staircases, squeezed through archways and were rewarded with views of the thousands of temples surrounding us. There was a shepherd with his goats feeding around one temple and he was completely distracted by his smart phone. It is such a strange thing to see villagers and monks in full traditional clothing taking photos of us or playing games on their smart phones. It goes to show how fast things are changing here now. Five years ago a mobile phone cost USD2000 (10 times the average annual salary) but now they are widely available and affordable to the masses. We accidentally found ourselves riding through one of the villages that lies amongst the temples. What a reminder of how poor so many of the Myanmar people are. Bamboo huts with some chickens clucking around is what they call home. December is winter and the night time temperatures fall below 10 deg C which cant be pleasant in a bamboo and palm frond dwelling. We chose an 11-hour boat trip along the Ayeyarwady (Irrawaddy) River to take us from Bagan to Mandalay. A relaxing day of watching life on the 1240-mile incredibly wide river that is the main water source for rice and vegetable crops and essential for goods transport. All the locals on boats and shoreline always waved and smiled at our boat. Their life is so simple and they seem so happy. This is always something that humbles me and puts life into perspective. It never lasts long enough when I get back to home to life and so much material stuff but it is so important to see and be reminded how other people live. Mandalay city is totally different from Yangon; it is far smaller with a very different vibe. Motorbikes are everywhere! The people seemed more 'modern' with more men wearing trousers instead of the traditional longyi skirt. There are more 'normal' shops rather than the tiny dark boxes of shops in Yangon with everything spilling onto the street. Finding a place for a beer in Yangon wasn't that easy. The combination of very low income and therefore disposable cash as well as the fact approximately 90% of the country are Buddhists means drinking has not been a popular pastime. In Mandalay however there are loads of beer stations serving draught beer and limited snacks. The food was different too with BBQs being the most popular. It was clear how much the wealthy local men enjoyed taking bottles of internationally branded whiskeys to restaurants - obviously a status symbol as well as a drink. At the risk of getting 'templed out' we took a day tour to surrounding villages around Mandalay: Sagaing, Inwa Village and Amarapura for U Bein bridge. Our guide Baba was very sweet and polite as all the Myanmar people are. She's from a village north of Mandalay and she explained that due to no foreign films or television she never saw a foreigner until she moved to the city as an adult. During our trip so many people have been taking our photo on their phones and apparently this is so they can show the people back home. All the village areas around city have their own handicrafts/trades. Nearly everyone works in the local profession and there is shop after shop of the same thing in each area. There was pottery, marble carvings, guitar making, weaving, silver work and noodles hanging up to dry in the fields. Surrounded by mountains and marsh land the 14mile long 7mile wide lake is a welcome change from the dusty streets of Mandalay. The surrounding hills are home to large numbers of tribes. They are now also home to a few wineries. Despite some European winemakers knowledge and marketing I don’t see Myanmar wine become a best seller anytime soon. The stilt house villages around the lake are home to the Intha people that rely on the lake for food and income. The Intha fish and get around in flat-bottomed skiffs. They are very precarious vessels, and when loaded to the hilt with people, laundry, food etc they get worryingly low in the water. Traditionally they were rowed using a single paddle that the driver wraps around his leg and then paddles using a figure eight like motion. While this is still used for short distances and while laying fishing nets incredibly noisy engines are now preferred. I thought an overwater cottage on the lake would be a very peaceful spot but we quickly realised the lake is a highway with traffic zooming back and forth and around from pre-dawn to post-dusk! Staying on the lake really is the only way to experience it properly and it was fantastic sitting on our balcony watching the birdlife skimming the water and diving into the floating lotus plants and reeds for insects. Witnessing the fishermen empty their nets of contents and then ending another great day with sunset over the hills. A truly idyllic spot on the Bay of Bengal. Fine white sand, swaying palm trees and perfect weather makes it a pretty likeable place. We only noticed one Hilton and large French hotel on our way from the airport, however there is a mass of construction. This 'secret' spot is sure to have a boom sooner than later. Right now it is still very sleepy and laid back and it’s almost impossible to get a rum sour after 9pm. The seafood meals feature as a highlight for us. Two beautiful crabs for $5 and four grilled king prawns for $6 washed down with $2 longnecks of beer is heaven in my book and the best possible way to relax at the end of a wonderful holiday. 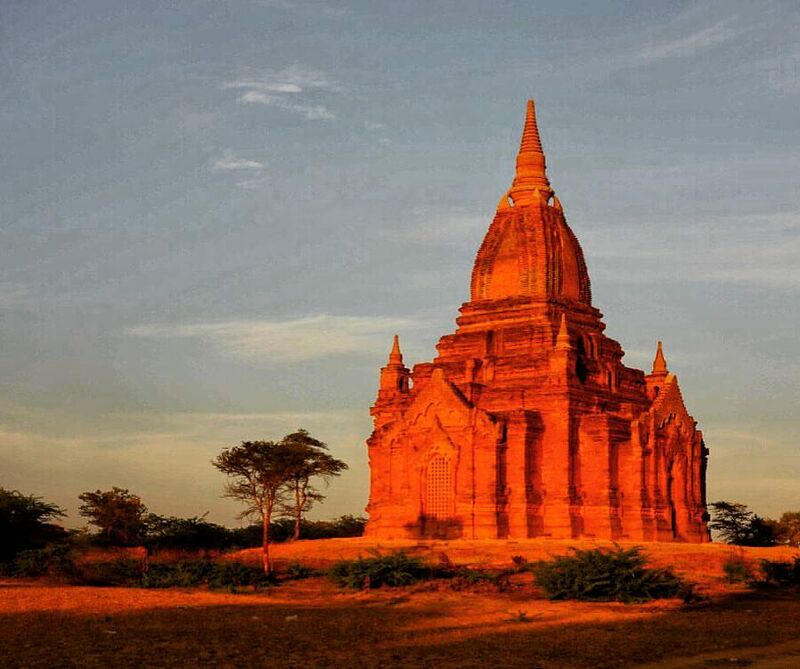 I encourage people to visit this great country and experience for yourself why Rudyard Kipling wrote Myanmar is "quite unlike any land you know about". We enjoyed the cities, the temples, the lake and the beach but I will mainly remember Myanmar for its kind, generous, softly spoken people. Blog written by our Journey Designer Emma Guthrie.